Rooftop botany goes to ground - my plant nursery: Wet and windy but think of next year! WA hearty Hello! to my seven dear followers and alright? to everyone else? There's not a huge amount to write about at the moment, unless you like reading about heavy rain, broken feet and other such heart-gladdening things. It really is tipping it down, making the few high points too wet to get off the ground. For example, the first of the four Clematis in my permenant-flowering Clematis tower, "Niobe", has two fully open flowers and many more to come, covering this tricky November-December period. But will it keep going until the alpina or macropetala one takes the baton. "Jacqeline du Pre", hang on, let me look it up ... It's an alpina, which, according to the article I Googled "C. alpina is highly suitable for sites which are cold and exposed." So that's a bonus! It should start flowering in very early spring so it might just work. Look, I wasn't hanging around in the rain standing at an awkward angle with a broken foot to focus the camera! There are a few other things to lift the heart, none on them flower-based. I noticed Hermodactylus tuberosa is breaking cover. For those of you who don't have it (and that's probably most of you, it's not a thing of great beauty, just a necessary curio for an Irisophile). 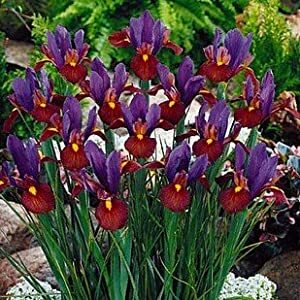 It was in the past included in the genus Iris as Iris tuberosa before getting its own meaty mouthful of a name. Although according to an article from The Pacific Bulb Society dated 2009 it's back in the gang! Which doesn't make it any prettier, with green standards ending and black falls. The leaves are like those of the reticulata section. A few other green shoots are poking through, including that already-growing Notholirion thomsonianum I planted just the other day, and also fritillaria assyriaca just poking through the gravel. So now I'm going to be checking the Frit pots daily, many of which I would prefer were under cover but there just ain't the room. The Notholirion tests the weather. Expect to see it go back down into the safety of its bulb! If this were InDesign or even Quark I would draw you a little circle or arrow to show you where the green tip is but it's about an inch down from the top of the pot and an inch in. A rainy mess. This photo makes it look much bigger than it is by the way. Trying to put a positive spin on thing, there are plenty of projects that were but seeds (geddit?) earlier this year. The Iris/antrrinhum combo I keep banging on about it coming along nicely, even if the irises are making a break for the moon. I've pricked out the Antirrhinums as we go along but I think there may need to be a little redistribution, although I only need about six to get the desired effect. Yeuch!, what do they see in them? It's like an upside down floor mop! Having just slagged off the xiphium hybrids I have one (that I got free) called Bronze Beauty (so a sort of washed out brown then, what you get when you you mix blue, red and yellow). Repulsive as they may be (I suppose most people would find my Frits hideous) they are a least showing signs of life when little else is. I What I'm really looking forward to is filling the clay pan with something much more fun once the leaves have died down and I can take out the Iris bulbs and dry them out. I know it was a bit naughty but some plants are too precious to leave to chance. This came as a single stem with a few leaves on the end but has bulked up to two buds so I think I can safely hope for my first ever Paeonia Mlok... you know what I mean. But I wouldn't want to be stuck in there just now, I accidentally used a batch of compost with moisture retaining granules so It's a bit like mud and jelly. Not an ideal sowing medium, although I'm sure the candelabra Primulas would live it to grow in. Iris douglasiana hybrids. There was nothing a fortnight ago! Can't help but admire your patience!! Nah, just the Irises & Lilies! Must admit though, my Strelitza still hasn't flowered after five! !